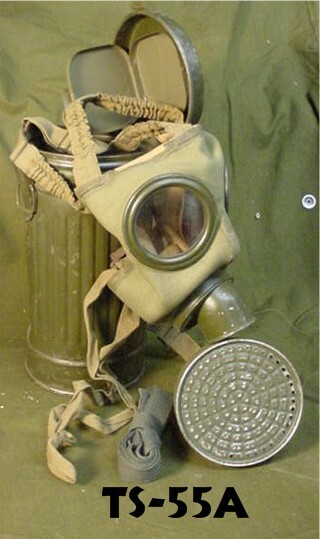 1.ST STYLE SHORT GASMASK CANISTER, COMES COMPLETE WITH ALL STRAPS. 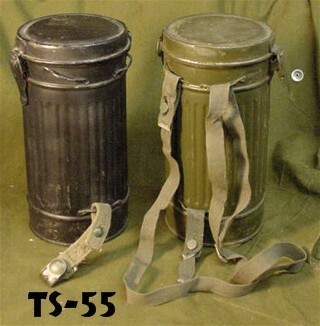 TS-55A WWI/EARLY WWII GASMASK CANISTER WITH GASMASK AND GASMASK FILTER, ALL STRAPS COMPLETE Everything you need at a great bargain with supplies last! 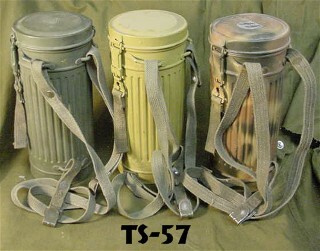 Canister comes complete with heavy canvas straps, Painted in EARLY WAR FIELD GREY, TROPICAL, LATE WAR DARK FIELD GREY, LUFTWAFFE BLUE, or paint scheme desired.